Unless you’ve been living under a rock, you’ve no doubt noticed that Hollywood seems obsessed with remaking old TV shows into new movies and series. While the trend seems to have gotten out of control lately, it’s certainly nothing new. Tinseltown has been rehashing old shows for quite some time. If you grew up in the 1960s or 1970s, you certainly remember the old Adam-12 series. The show ran for seven successful seasons and was created by Dragnet’s Jack Webb. By the time the show had come to an end, it seemed like LAPD Officers Pete Malloy (Martin Milner) and Jim Reed (Kent McCord) had responded to every disturbance imaginable. 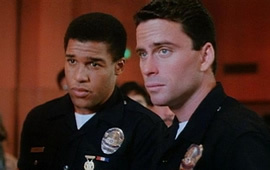 In 1989, seven years after the death of Webb, some producers decided to revive the concept as The New Adam-12. The cast and characters had all changed but the name of the black and white squad car — Adam-12 — was still the same. African-American Gus Grant (Peter Parros) and Caucasian Matt Doyle (Ethan Wayne) are the focus of the new show. The cast and crew tried to make this version grittier and more current but, compared to today’s dramas like The Wire and The Shield, The New Adam-12 seems pretty tame. The show aired in first-run syndication for two seasons and yielded 52 episodes. The last episode is called “The Fighter” and follows the officers as they try to prevent a Latino gang war while the execution of a cop killer looms in the background. Take a look.